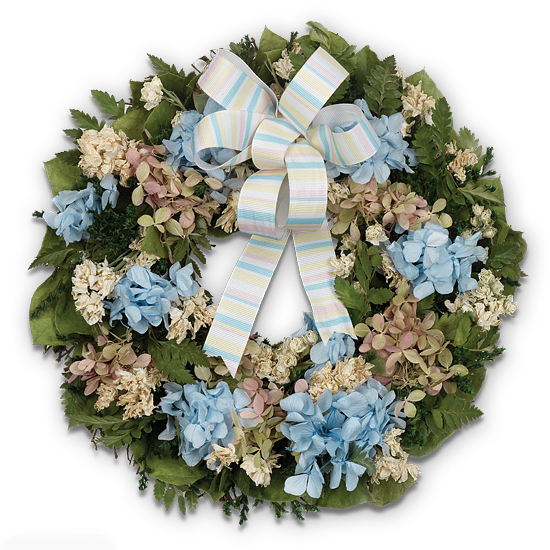 Welcome baby to the world with this precious little wreath to adorn the nursery. A special way to congratulate a new mother (or grandmother! ), our exclusive, charming wreaths are pastel clusters of hydrangea blossoms, preserved to perfection and arranged on a base of green caspia and natural salal leaves with sprigs of maidenhair fern tucked in between. A full gathering of pastel striped ribbon lets you display the wreaths with ease. These also make great baby shower gift for new moms-to-be. Add baby handprint kit in pink or blue. Display stand not included with handprint kit.